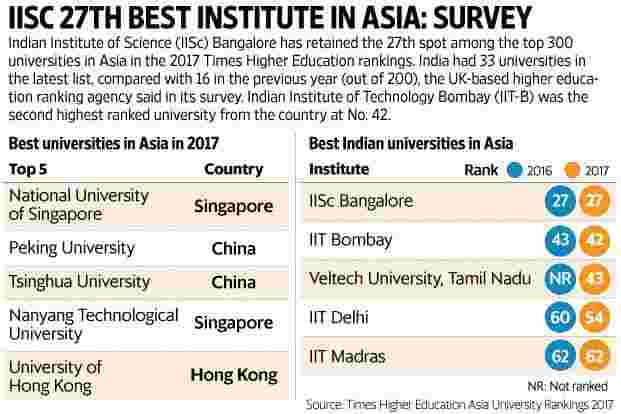 New Delhi: Indian Institute of Science (IISc) in Bengaluru has been ranked 27th among universities in Asia even as India more than doubled its representation in the list of top 300 Asian universities in 2017, according to Times Higher Education (THE) University Rankings. India had 33 universities among the top 300 in the Asian university league table compared with 16 in the previous year among 200 varsities, the UK-based higher education ranking agency noted in its survey of Asian Universities. The country is still far behind Japan and China, the survey added. “It is great news that India has more than doubled its representation in this year’s ranking of Asia’s best universities, claiming 33 places in the top-300 list …It means that India is now the third most-represented nation in the table for the first time," THE editor Phil Baty said in an email. IISc Bangalore retained the 27th rank for the second year in a row, according to the survey. Indian Institute of Technology, Bombay (IIT Bombay) was the second highest ranked university from the country at No. 42. Tamil Nadu-based Veltech University secured a surprise 43rd rank in Asia, much ahead of several top IITs in India. This is the first time the institution has secured a ranking in the league table. IIT Delhi at No. 54 and IIT Madras at No. 62 are the other top-ranked universities from India. IIT Kanpur jumped to the 63rd place in the current year from the 101-110 grouping in 2016, according to the survey. Kanpur’s performance was attributed to across the board improvements and a sharp increase in industry income. Across Asia, Singapore’s National University and China’s Peking University have been ranked first and second, respectively for a second year in row. Tsinghua University of China, Nanyang Technological University in Singapore and University of Hong Kong of Hong Kong complete the top five list in Asia. India has been taking steps to improve its top universities global rankings and has proposed investing money to help its top schools climb the global rankings. India has also launched a national ranking framework to create a culture among Indian schools to participate in rankings in a structured way and compete with each other domestically. Baty said India’s strong performance is partly due to country recognition of the “importance of participating in global benchmarking exercises". “But lower down the table, several Indian universities have slipped places because of increased competition. For example, the University of Calcutta has dropped from the 141-150 band to the 191-200 cohort while Amrita University has fallen from 181-190 to 251+," Baty added. After the first 100 ranks, THE puts universities in groups and does not give them individual ranks. On how Veltech has moved to the big league, Baty said its research paper citations is one of the key factors. “A strong performance in the rankings requires universities to perform well across a basket of measures, although extremely strong performances in some key measures can provide a boost in overall performance, as is the case, for example, with Veltech. “Veltech has relatively few publications over the past five years (around 1,500) but many of these perform extremely well in terms of citations. These papers appear to be clustered in the area of chaotic systems and having highly cited work within a relatively small pool of publications can have a positive impact on a university’s rankings," Baty said in the email.